English stamped calf, ca. 1540, with the Tudor rose. G. Libri sale (London, Aug. 1, 1859, cat. 1859 no. 1272) to Willis; purchased (Oct. 1860) from Appleton by Theodore Irwin, cat. 1887, p. 217, no. 1369; purchased by J. Pierpont Morgan (1837-1913) with the Irwin Collection in 1900; J.P. Morgan (1867-1943). 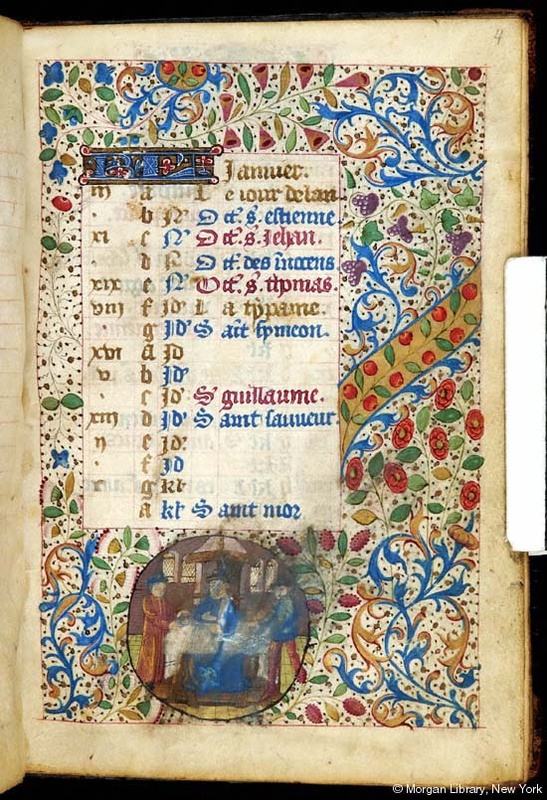 Ms. book of hours for the use of Rouen (calendar in French); written and illuminated in France, probably Rouen, ca. 1470. Artist: Workshop of the Master of the Rouen Echevinage. Decoration: 3 large miniatures; 6 historiated border vignettes; 47 calendar vignettes, comprising labors of the months, Virtues and Vices, Old Testament, and "historical" scenes.